Gone are the days of iceberg lettuce topped with limp veggies and bottled, processed dressings. No wonder I didn’t really enjoy salads until recently…I thought that’s what they were all about! 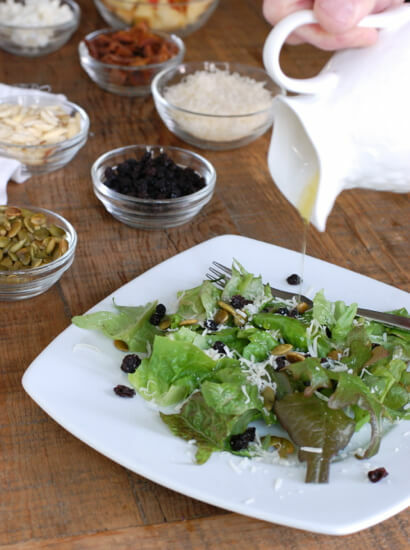 It’s amazing how incorporating fresh greens, roasted nuts or seeds, distinctive cheeses, fresh fruit, and homemade dressings can change everything. And I know I am late getting on this bandwagon, but I’ve recently discovered what a real gem dried fruit is as a salad topping as well. I wish I would’ve figured that one out much sooner! So today I am taking the idea of a fresh, tasty salad a step further with one of our sponsors, NatureBox. Their company delivers attractively packaged whole food snacks to your door that include everything from nuts to seeds to dried fruit to trail mixes. Their offerings are more than enough to keep things interesting especially if you use their snacks to create a “make your own salad bar.” Who knows, maybe you could even pique the interest of your previously skeptical child? Seriously, who wouldn’t like to prepare their very own dish? Even if they end up with just 2 pieces of lettuce and loads of dried fruit, seeds, and cheese, don’t judge…everyone has to start somewhere. :) I can tell you my daughter was (not so patiently) waiting for me to finish these pictures just so she could dig in to all this deliciousness herself. Presentation can make all the difference even for a our little ones. 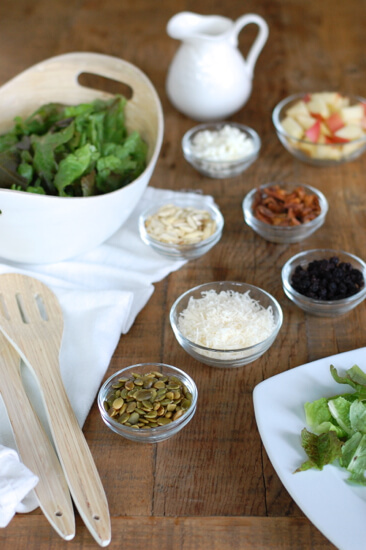 Even if you don’t have time to make such an elaborate display, there is a simple salad recipe below and still plenty to enjoy from NatureBox. Signing up for their service means you get a different box of wholesome, minimally processed snacks (at least 15 – 20 servings worth) delivered to your door step each month. You can either choose your own combination of snacks or be surprised (like a CSA box!). They sent us a box to try and so far our favorites have been the roasted garlic pumpkin seeds, dried pineapple, and currants (my daughter says “Like raisins, but different!”). We’ve toted these snacks on road trips, added them to school lunches and, as mentioned above, used them as salad toppers. Sometimes trying something new and different can just help you get out of a rut. Disclaimer: Not all NatureBox products follow our real food rules although the ones highlighted in this post are real food approved. As always, it’s advised to read ingredient labels before making any purchasing decisions! Are the items Organic? Or GMO free? Stacie – They are not labeled as organic. Some of their products are labeled as GMO-free. This looks like a fun way to get some new snack and salad items. I noticed that some of their items are more “real” than others so I would probably want to pick my own items for the boxes. I wish these snacks were organic!!! Dried fruit very high in sugar. Better to put chopped fresh apple or orange segments on salad greens. Sue – The “sugar” in dried fruit is naturally occurring and not necessarily added/refined. I think it’s a perfectly fine addition to an already healthy salad. Lisa, you are a good writer. I enjoy your posts. And I’m sure you’re choosing dried fruit without added sugar which is perfectly fine in a reasonable amount. I’m going to assume you’re not dumping the whole bag on your salad, so I’d say dried fruit is a great choice for a topping sometimes, organic or not. Your website has been a huge inspiration and has truly kept my interest at a peak. <3 Thanks for all you do! Thanks for this great article. We often forget about salads in the winter because its cold but this roasted pumpkin seed and current salad looks yummy especially as it starts to warm up and greens come into season in the spring! All dried fruit has high sugar naturally, it is not added. Fresh organic fruit so much more healthy. Sue – Fresh fruit has the same natural sugar as dried fruit (albeit less concentrated). I think with anything variety is key. I got my first Nature Box yesterday and I love it! So I just want to get some things clarified… I know you try to buy all organic and from what I can read these products from the Nature company are not? So how do you knowif they contain chemicals. If buying only organic fruit from the store is what we are trying to do how is buying non organic dried fruit okay? I am 100% not being rude here. Really trying to learn the “rules”. I want to buy the products they look great, but I am unsure if this is an endorsement for the product or something you truly believe is a healthy great chemical free product for our families. Thank you. Very well said Sheri………same thoughts here. Yes please answer this! Why not endorse an organic product? Not trying to be rude either….just want to know why? The NatureBox products I’ve featured in this post all follow our posted rules. I hope that makes sense! Country Ranch Peas: green peas, corn starch, modified corn starch, cane sugar, refined soybean oil, salt, natural flavors, dextrose, maltodextrin, citric acid, malic acid, silica, spices. 20$ for 5 tiny 4oz bags of weirdly flavored peas, almonds & Co with no choice to individually pick your bags doesn’t sound like a good deal to me. I am not wondering anymore why products like that are promoted. Pecunia non olet. Hard to beleive you are promoting non organic high sugar foods……. Shea – Organic is not required (although preferred) to take the 10-day or 100-day pledge and none of the products I’ve featured on this post contain added, refined sugar. Looks like a good way to help my daughter enjoy salads more. Everyone loves choices. I’ll have to give it a try. Not sure why some people are saying that dried fruit is high in sugar. Dried fruit has the same amount of sugar in it as fresh fruit. It is just lacking moisture. This makes it less bulky so you need to pay attention to how much you are consuming. In moderation it is a good substitute for when fruits are not in season. I’m not big on dried fruit, but my husband is. This would be perfect for us if the stuff were organic, but I have to assume it isn’t since they’re not promoting that. Looks great, just placed my order. Price is no different that buying dried fruit or trail mix at the store and I like the variety. Keeps you guessing each month. Just like any snack food, moderation is the key. If people are crying that it’s not organic or GMO free that’s their prerogative, I know I don’t have the time or energy to buy everything organic or GMO free. As it is I spend most of my nights making food, snacks, lunches, etc. for the family. A few premade snacks ready to go is greatly appreciated. Thanks for all the great stuff Lisa. Yep – the variety and “surprise” definitely make such a service attractive, but this seems like pretty much the same stuff I can get from the bulk bins at Whole Foods or our local co-op. Since I already shop at those places for other groceries I’ll just continue to take an extra five minutes and get the organic bulk stuff. They do seem to be a company with their heart in the right place. I love that they donate to fight hunger. Their snacks are definitely 99% better than most of what’s out there, for sure. I agree…these snacks are much better than what’s typically part of the Standard American Diet! Not trying to be rude but I am shocked that you are promoting this company. Their ingredients are not organic, they use processed oils (peanut and canola) and processed sugar in many of their products. A lot of what you teach about eating real food is basically thrown out the door when you buy this type of stuff. I understand the convienence of ordering from someone like this and love the salad idea, but I think there are better options out there. I love your blog and the concept of real food but really have to question things when it comes to the sponsors you choose. Kelly – Believe it or not we turn away a lot of potential sponsors that deviate too much from our real food rules (which by the way do not officially require foods to be organic or oils to not be refined: https://www.100daysofrealfood.com/real-food-defined-a-k-a-the-rules/). Most people who follow this blog do not abide by these real food rules 100% of the time. There is quite the spectrum when it comes to our readers’ eating habits, and I think the snacks I’ve featured on this post are a big step in the right direction for many. If these products are not something that are a good fit for you personally then by all means there is no obligation to try it. I hope that clears things up. You are so welcome…and thank you for that! :) Shawn our FB Moderator introduced me to your dressing and it’s yummy. 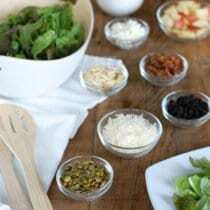 Just placed my first order and am looking forward to trying some different snacks and salad toppings. Hoping this will encourage my pickiest eater! If this is the program I am thinking about, it is part of Wal-Mart. No thank you! Michelle, the program from WalMart is called The Goodies Company. Thanks for clarifying, sometimes it’s hard to track down who the parent company is. I had read about Wal-Mart’s program, but never seen it. This is very similar. Some of their products look great, others don’t. This is a great start for those trying to be more healthy, but there is a lot of room for improvement by this company. I find the intro to this so funny. It reminds me of my husband. When we met he swore he hated salad, but what passed for salad where he was from was old iceberg lettuce with a wedge of mushy tomato and ranch. Gave me a good giggle. I have recently heard about naturebox as well, and although I decided they weren’t the right choice for my family, they are still a much better choice than a lot of snacks out there. For those of you looking for a similar snack box, healthysuprise.com might work for you. They are mostly vegan, gluten free, soy free and mostly certified organic. Looks yummy! I think we’ll give this a try! Did anyone else find that the $5 off link didn’t work? I want to order this, but the link for the $5 off isn’t deducting the discount from my shopping cart, which is kind of annoying. Is the offer over already? 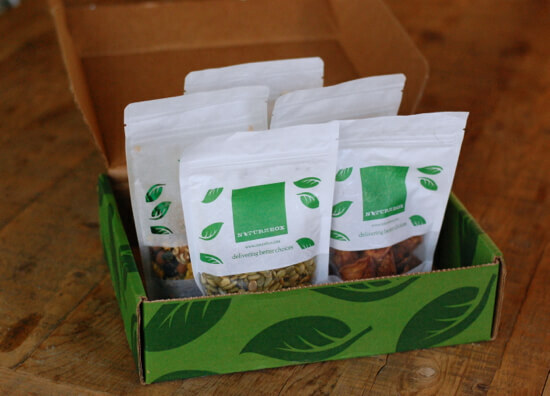 Thank so much for your message and interest in NatureBox! I am so sorry to hear that the link isn’t giving you the $5 off properly- we are taking a look to see why this might be! In the meantime, you can type in the code REALFOOD under “Promo Code” and then click APPLY and the $5 should discount that way as well. If you have any problems with that, please feel free to email me personally ([email protected]) and I would be happy to assist! Yes, I too am disappointed — the Family Snacker is also no longer available to Personalize. I am just guessing but I feel like they were not ready for Lisa and her readers. Live & Learn. Thanks so much anyways — I love. love 100 Days of Real Food!! Thanks so much and we look forward to having you in our community of healthy snackers! Ingredients: Dried Cranberries (cranberries, sugar, sunflower oil), Golden Raisins (dried Thompson seedless grapes, sunflower oil, sulfur dioxide [to preserve color]), Dried Cherries (cherries, sugar, cherry juice, sunflower oil, citric acid), Dried Blueberries (blueberries, sugar, sunflower oil). Thank you so much for your message and for joining NatureBox. I hope to be able to be of some assistance! While a few of our dried fruit blends (such as the Wild Berry Bunch) do contain naturally-occurring sulfur dioxide, a majority of them (including pineapple, apples, cherries, mangoes, figs, pineapples, currants, and apricots) do not and we are continually adding more and more unsulfured fruits as we know that this is important not only to us, but to our customers as well. For a better fruit snack-alternative or salad topper, may I recommend the Dried California Bing Cherries? If you’d like, I would be happy to work with our Customer Care Team to swap this out in your most recent order to ensure your box is full of snacks that are the best fit for you. Please feel free to reach out to me directly if you’d like ([email protected]) and I look forward to assisting! Natural Flavors, Canola Oil, Processed Sugar, Citric Acid, Soy Lecithin, Non-Whole Wheat Flour and Modified Corn Starch. I love your blog and visit it daily, but this choice of sponser really makes me wonder about its (the website’s) credibility anymore. And as always I hope readers remember what I like to say over and over again…read ingredient labels before making any purchasing decisions! It sounds like you are already doing a great job of that for your own family. Hi, my 2 year old is sick with a cold/cough, and just wondering what you give your kids when they are sick? A lot of the reccommendations are ice cream pudding etc, but I know sugar does not promote healing & is hard on the body. We do yogurt w/honey & blueberries, but any other suggestions for soothing foods on the throat that are healthy? Thanks! For those who were interested in Healthy Surprise, click here (https://www.100daysofrealfood.com/real-deals-discounts-promo-codes-coupons/ ) to save $20 on your first box! Like Naturebox but snacks from all different companies each month! I tried naturebox and hated it. Way too expensive and the snacks didn’t taste good. Especially considering they aren’t even organic, I would never buy it again.